Our mission is simple: We are here for students. We come together for a common educational purpose: to help our diverse community of students thrive intellectually, physically, spiritually, and personally. How We Fulfill Our Mission: We partner with students, faculty, and staff to develop enriching environments and experiences that promote students’ knowledge, wellbeing, independence, and accountability. As educators, we facilitate opportunities for learning more about ourselves and others, developing the capacity for human understanding, and solving problems in creative and innovative ways. We support students in discovering a sense of purpose, fulfillment, and joy. We call upon members of our community to serve locally, nationally, and globally. We foster a safe, accessible, and inclusive MIT campus and sense of belonging for all. We value shared-governance and collaboration, and lead with integrity, innovation, and a commitment to continuous improvement. (November 21, 2016). 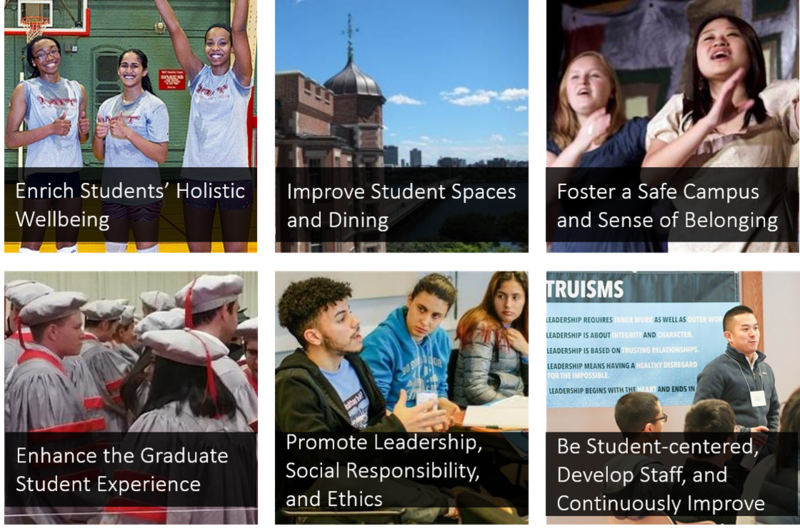 These priorities and goals were developed through a collaborative process involving DSL staff, division leadership, and MIT senior leadership. The letters after each goal correspond to the names of departments involved in the work related to that goal. Develop and enhance the GRA position, including “cluster” system for smaller groups. INITIATIVE 1: Improve cost, access, and quality of campus dining. Develop student diversity and inclusion knowledge, skills, and awareness.